In 1812, the Academy of Natural Sciences was founded in Philadelphia “for the encouragement and cultivation of sciences, and the advancement of learning.” Two hundred years later, its mission still rings true. Today, the Academy continues to promote the learning of science. It has particularly focused on a field which affects every visitor – the environment. The Academy was ahead of the curve when it started its Environmental Research Division in 1948. The U.S. government would not pass anti-pollution laws such as the Clean Water Act and Clean Air Act until the 1980s, but the Academy’s dedication to studying different ecosystems led to efforts to save them. Currently, its endeavors to protect the natural world have resulted in programming, research, and aid to other organizations. The Patrick Center for Environmental Research is another of the Academy’s efforts to best understand the natural world. Dr. Ruth Patrick founded the Center (then called the Department of Limnology) in 1947 to explore how society could protect environmental quality. Today the Center consists of nearly 20 Ph.D. scientists and engineers with a wide range of specialties. These professionals work together to understand the natural world and society’s affects on it. They also communicate with political, industrial, and environmental groups about how to keep the natural world healthy. Finally, they oversee a variety of projects on both a local and national level. 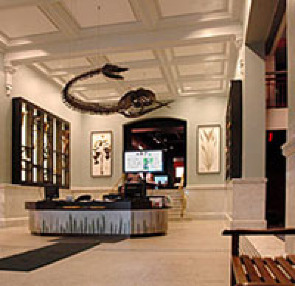 The Academy of Natural Sciences Museum also promotes environmental awareness. Both family programs and field trips explore concepts of species’ extinction, habitats and ecosystems, and stewardship. Overall, the Academy succeeds in teaching from both an academic and a practical standpoint. Not only do participants in these groups and programs learn scientific details and discoveries about the environment, but also how the natural world affects their own lives.